No witty intros today, so let the confessing begin! 1. We have entered home reno mode. Sort of. Like, weekend-only-after-1pm-because-we-value-our-sleep-home-reno-mode. We ordered nice white doors about a week ago and they came in on Friday night. Mike went out and bought all the trim for around the doors, and it's my job to paint the other trim this week. I'm also on a mission to pick out all the different wall colors, so that's fun. We've got 10 or so doors to replace and 2 bedrooms and the living room and hallway to paint. 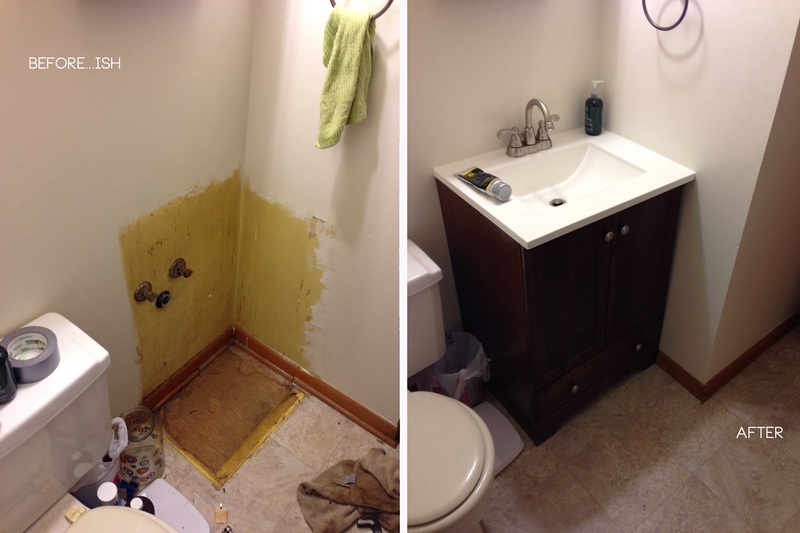 Just yesterday we (and by we I obviously mean Mike) replaced the vanity in our master bedroom's half bath. We (and by we I obviously mean Mike) are probably going to be sinners and replace the toilet that's in there today (yes, a Sunday - GASP!). I'm making a note to start taking all the "before" pictures today or tomorrow before things get too serious! 2. I skipped two runs this past week. And.... I'm going to try to make up my 5 mile run today. 3. We have stopped ze house hunt. After talking about it, we have realized that we might not want to settle in Lincoln (holy property taxes, Batman! ), so we have decided to renovate our current house to make it what WE want for the next couple of years, then when Mike is done with school in 2015 (can't come soon enough), we'll see where life takes us. I'm kind of bummed that we'll be bound to 960 sq ft for the next couple of years, but I'm kind of excited to have a house where I can be all, "LOOK WHAT WE DID!!! WE TURNED A HIDEOUS HOUSE INTO SOMETHING LOVELY!!" 4. I keep wearing cute outfits and wanting to do outfit posts (because that's part of the fun of being a vain blogger)... but then I realize I have no one to take my picture. And I think Elsie would try to eat my camera if I asked her to do it. 5. I hate bras. And if it was socially acceptable, I would NEVER wear them (except when running, because let's be real - running without a bra would NOT be comfortable). home renov is a tiring stressing, but also exciting thing at the same time. good luck on your project! i bet the house will turn out beautifully! I'm totally thrilled to see your home now that you're updating it! And to be a guest in such a lovely home =). I bought 3 new bras today. My old ones are doing the thing where they make the weird lines and make you look frumpy. We are going to be sinners in May when we run 13.1 miles on a Sunday. I'm pretty sure that's the opposite of rest. I despise bras as well. I love my sports bras because they fit. I have the oddest bra size...30D...which makes bras impossible to find. I scrape by wearing 32Cs on the smallest closure.